We’d love your help. Let us know what’s wrong with this preview of Marked Fur Murder by Dixie Lyle. Deirdre "Foxtrot" Lancaster is fed up with all the goings-on at wacky billionaire Zelda Zoransky's mansion. Running around like a chicken with her head cut off, she's got a laundry-list of things to do. ZZ is hosting yet another one of her famous salons. Her nutty guests have more than their fair share of odd requests and strange demands. And now, friend Ben's estranged si Deirdre "Foxtrot" Lancaster is fed up with all the goings-on at wacky billionaire Zelda Zoransky's mansion. Running around like a chicken with her head cut off, she's got a laundry-list of things to do. ZZ is hosting yet another one of her famous salons. Her nutty guests have more than their fair share of odd requests and strange demands. And now, friend Ben's estranged sister has been found dead in Zelda's pool, an apparent suicide, with a hairdryer floating beside her. 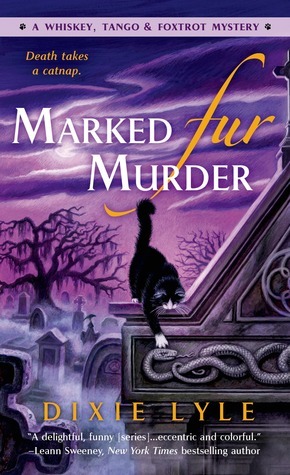 To ask other readers questions about Marked Fur Murder, please sign up. I really do enjoy these books, but they sometimes get a bit esoteric. * The setting, it is one of the more unique ones - a rich eccentric who has fashionable salons in current day as well as practically her own zoo and is next door to one of the biggest pet cemeteries. * Foxtrot (although it is still weird she goes by that name). She is the perfect assistant as she can solve just about any crisis - including murder. * Whiskey and Tango are in great form as always. What could have been I really do enjoy these books, but they sometimes get a bit esoteric. * Why can no one just say what they mean??? I enjoy this series, but the earlier books were better than this one. The author seems to be trying a little too hard now. This plot felt contrived. Love the development of the characters from book to book, and how the murder investigation is woven around that. I love this series! One of my very favourites and at book 3 I still love it as much as with the first book. This is a wonderful combination of cozy mystery, a little paranormal twist, great characters, very well-conceived and clever plots, and a LOT of terrific one-liners and laugh-out-loud humour. This series is perfect if you enjoy any or all of the above components, and want something light, fun easy-to-read and entertaining. Foxtrot is a super character. She's smart and resourceful, she can dea I love this series! One of my very favourites and at book 3 I still love it as much as with the first book. Foxtrot is a super character. She's smart and resourceful, she can deal with anything [and I DO mean ANYTHING! Some very bizarre things happen regularly in her world!] and she is kind and loves and cares for everyone around her, even when they don't deserve it. Plus, she's hilarious and sees the humour in the ludicrous and bizarre and her reactions to the stuff that goes on is some of the best parts of this series. Then there are the magical animals that live in this world. They, also, are absolutely hilarious, and get some very funny lines of their own. I was a little uncertain regarding this book. As with the last one this is more urban fantasy than actually a mystery. They spend most of the time hunting a mythological snake. This is one of those books where you can’t decide whether the explanation is really a supernatural one or something mundane. The conclusion was nicely done though. Since the story was the book’s weakness I would’ve given less stars if the humour wasn’t top-notch again. Most of the conversations between tango and whiskey m I was a little uncertain regarding this book. As with the last one this is more urban fantasy than actually a mystery. They spend most of the time hunting a mythological snake. This is one of those books where you can’t decide whether the explanation is really a supernatural one or something mundane. The conclusion was nicely done though. Since the story was the book’s weakness I would’ve given less stars if the humour wasn’t top-notch again. Most of the conversations between tango and whiskey made me laugh out loud and the description of the honey badger was glorious. But one of the greatest problems was the victim herself. You only met Anna briefly in the first novel so there isn’t much of a reference point. But you still have to wonder why her trophy husband would cry at her demise. Her behaviour was also kind of contradictory. On the one hand she went to the outback to protect people while she learnt to control her talents, but she did marry someone she didn’t love and no one knows why. In conclusion not as good as the other ones story wise but still very funny. Once again Foxtrot and her assistants, Whiskey and Tango are busy solving a mystery or two or three. The murder mystery begins with the death of Anna, Ben's sister, who was also a Thunderbird. Is someone targeting Thunderbirds? It seems likely when Ben is shot by a crossbow. Sightings of a colorful extremely large snake add another mystery for the team. Marbles placed on cat headstones in the graveyard is one more puzzle to solve. Foxtrot and friends race around a bit, but eventually figure it Once again Foxtrot and her assistants, Whiskey and Tango are busy solving a mystery or two or three. The murder mystery begins with the death of Anna, Ben's sister, who was also a Thunderbird. Is someone targeting Thunderbirds? It seems likely when Ben is shot by a crossbow. Sightings of a colorful extremely large snake add another mystery for the team. Marbles placed on cat headstones in the graveyard is one more puzzle to solve. Foxtrot and friends race around a bit, but eventually figure it all out. In each of the books in this series there are examples of man's inhumanity to animals. These horrific incidents are a sharp counterpoint to the loving aspect of the graveyard/crossroad. In this book one example was the answer to the marble mystery. Despite the illegality of her action and her mental illness aspects, applause to Theodora for avenging Marbles the cat. I fully enjoyed this book. The back and forth between Whiskey and Tango is more than worth the read. I see furred friends in both of them. The murder of a Thunderbird -- electrocution in a swimming pool -- and finding the murderer is well written and believable as are the excursions into the Thunderscape. I did not see the ID of the killer until shortly before the unveil. If for no other reason, check out this book for the interplay between humans, ghosts, gods, and animals. You will like that as I fully enjoyed this book. The back and forth between Whiskey and Tango is more than worth the read. I see furred friends in both of them. This is the first in the series I have read and I thoroughly enjoyed it. Well written, and still funny and goofy. Sorry, but this book just wasn't my cup of tea. Deirdre "Foxtrot" Lancaster makes her living tending to the needs of ZZ, an eccentric billionaire. In her off-time, such as it is, she acts as a caretaker of a nearby pet cemetery which doubles as a supernatural animal crossroads. Anna, her boyfriend's sister, is murdered in ZZ's pool and Foxtrot decides to investigate as she's worried that whoever targeted Anna might come after Ben next. Anna and Ben are Thunderbirds and have the ability to control the weather so the chances of one dying from electrocution are about as likely as me overdosing on chocolate...simply not possible. Foxtrot is ably assisted by her ghostly dog Whiskey and reincarnated psychic cat Tango. The cast of suspects was very diverse and ranged from a schizophrenic writer who held conversations with imaginary creatures to an owner of a dog that painted whatever images his owner transmitted mentally. Their personality quirks (of which there are many!) helped keep the voices individual and distinct. The same held true for Whiskey and Tango as the former fell for an apparently hot border collie while the latter was supremely indifferent to anyone's needs other than her own. The mystery was neatly done and there were some lovely red herrings scattered throughout which kept the pace bubbling along. Foxtrot was a good investigator as she approached things fairly logically and took full advantage of her pets' abilities. Both were cajoled into interrogating pets and ghosts who might have seen or heard what happened. It was the supernatural elements that really held my attention though. I relished the Thunderbird lore we were given but I still haven't reached saturation point and would love more detail in future books. We see Anna through the eyes of Ben and the guests rather than getting a chance to meet her properly ourselves. This combined with the fact that she was killed so quickly made it difficult to care about her as a person. Instead, we are forced to judge her by the impact she had on others. Thankfully the secondary characters are quite verbose on their feelings for her but it felt like a bit of a missed opportunity. If you haven't read any other other books in the series then it might come as a bit of a shock that a) Thunderbirds exist and b) a cemetery can act as a portal for deceased pets who want to pop back to check up on their owners. Lyle doesn't spend too much time going over past events so while you could read this one as a standalone, I suggest you read the first in the series before diving in so you have a clear understanding of the world. A whimsical paranormal mystery that is quirky enough to keep you coming back for more. This time around, murder hits close to home: the victim, Anna, is the sister of Foxtrot’s boyfriend Ben. Like Ben, Anna is – or rather, was – a Thunderbird, able to sense and control the weather. It appears that an ancient enemy may be trying to eliminate the Thunderbirds. Throw in a large rainbow-colored snake that may or may not be real, a predatory activist with her eye firmly on Ben, Anna’s grieving but unfaithful husband, a schizophrenic writer with a pair of imaginary friends, an artistic dog and her psychic handler, and a secondary mystery involving marbles left on cats’ graves, and you’ve got the sort of wild and wacky mystery that could only come from the pen of Dixie Lyle. The dialogue and Foxtrot’s narration are full of the word play and humor I’ve come to expect from this series, but they don’t detract from the mystery’s tension and excitement, nor from the real and growing feelings between Foxtrot and Ben. Like the previous books, this one requires a stronger-than-usual “willing suspension of disbelief”, but if you can set aside your skepticism for a few hours, I think you’ll enjoy the ride. This series is a pretty steady 4 star read for me. Actually, I'm so pleased I'm participating in a "Read a Series in a Month" challenge which has prompted me to finally get around to reading them. In this installment, Foxtrot once again is smack dab in the middle of a mystery along with her paranormal sidekicks. ZZ has a new crew of individuals staying at her mansion and Foxtrot's boyfriend Ben's sister has been found dead. Now very few people know it but Ben and his sister are members of a dyin This series is a pretty steady 4 star read for me. Actually, I'm so pleased I'm participating in a "Read a Series in a Month" challenge which has prompted me to finally get around to reading them. In this installment, Foxtrot once again is smack dab in the middle of a mystery along with her paranormal sidekicks. ZZ has a new crew of individuals staying at her mansion and Foxtrot's boyfriend Ben's sister has been found dead. Now very few people know it but Ben and his sister are members of a dying group of Thunderbirds, individuals with Native American roots who can control the weather. There is also another Thunderbird visiting and a bunch of other kooky characters including a rock star, a dog who can paint through psychic commands from his owner, a transgender mystery writer with mental health issues and Anne's husband, who seems out to only get Anne's money. Without giving too much away, this book once again provided tons of entertainment. The banter between Whiskey and Tango and Foxtrot's off the cuff remarks really add some humor. Also, all the characters are painted so vividly that one can almost imagine being a guest alongside of them. I also enjoy how Lyle manages to have a major mystery, as well as some side plots all interwoven to keep the reader entertained. I love paranormal books, but I have to be able to suspend disbelief by falling into a decent plot and getting caught up in the characters. This series, at least in this book, has gotten a bit outlandish (and by a bit, I mean absolutely crazy wack-a-doodle!). -Foxtrot, seemingly normal PA. Can see and interact with spirit animals. -Sidekick 1: Whiskey, ghost dog who can change shape at will. -Sidekick 2: Tango, reincarnated pet cat from Foxtrot's childhood, who speaks I love paranormal books, but I have to be able to suspend disbelief by falling into a decent plot and getting caught up in the characters. This series, at least in this book, has gotten a bit outlandish (and by a bit, I mean absolutely crazy wack-a-doodle!). -Sidekick 2: Tango, reincarnated pet cat from Foxtrot's childhood, who speaks multiple animal languages. -Kooky Employer's Deadbeat son, who seems to exist merely as filler when things get dull. -Secondary employer, an enigmatic Spirit Crow, seemingly the overseer of the Animal Crossroads. -Mysterious animal graveyard with an important role in the animal afterlife. -More Thunderbirds, another reincarnated cat, more spirit animals, a pet "psychic" with a painting pooch, a crazy writer with imaginary friends and on and on and on. Nothing like starting with the third book in a series. Took awhile to get into the story, because I was obviously in the middle of some story lines. Native American and Australian Aboriginal myths come to life along with beloved pets and the rainbow bridge. The keeper of the crossroads works as a private assistant to an heiress still living in the sixties. A quirky cast of characters -- a psychotic writer with imaginary friends, a rock star, a conman, etcetera. Keep the story moving and the myst Nothing like starting with the third book in a series. Took awhile to get into the story, because I was obviously in the middle of some story lines. Native American and Australian Aboriginal myths come to life along with beloved pets and the rainbow bridge. The keeper of the crossroads works as a private assistant to an heiress still living in the sixties. A quirky cast of characters -- a psychotic writer with imaginary friends, a rock star, a conman, etcetera. Keep the story moving and the mystery mysterious. Guess I'll go find the first two books and get caught up on those story lines. in my opinion this one is much better than the 2nd book in the series. The story opens with the murder of a minor established character. Though this one is a lot more focused than the 2nd book Foxtrot has to work her way through a believable number of red herrings and then watch her boyfriend get eaten by a giant rainbow spirit snake. Don't you hate it when that happens? I'm enjoying the characters more and more, but would like to see more interaction with established characters. Now...this was a cute, humorous read. Kitties, dogs, ghost animals and a keeper of the Pet Cemetary. Oh...then there's the murder of a Thunderbird! A decent mystery with some paranormal thrown in...a fun read. I really enjoy this series, but this book took me a bit longer to get into than the first two. Once I got into the book, it flew by. I love Foxtrot and the way she interacts with the everyone and everything. I look forward to the next mystery to come. I'm new to this series. The characters are interesting, the story is full of interesting mythologies but the plot seemed a little contrived and all the elements don't quote flow. However I will be looking for some more books in the series. I can't finish this book when I pretty much figured out who committed the murder. And upon checking and seeing that I was correct in my guess and getting the answer of why, I didn't see a point in reading it through. I enjoyed the first two in this series much more. Couldn't finish book. When I read the first one, I had trouble finishing it too so I decided to give the author a second chance. Not worth it. I love supernatural books that animals. Dixon's companions are fun and so much like the real thing. Sometimes I think she used my cat as reference. Hubby and I are both into this series. Lots of twists, great characters! Book 3 continues keeping the interest in Foxtrot, Whiskey, and Tango's unusual adventures! Hooray! I really like this series. One of my favourite paranormal cozy sets, with laugh out loud humour.